So we're here to scrub up on bathroom lighting ideas. As with all the home lighting design pages, this page takes us through different bathroom lighting designs and talks a little about each option. The illustrations are really simple, to keep us focused on the concepts. 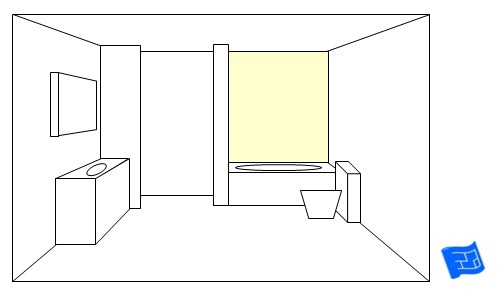 Then at the bottom of this page there are some photos of bathroom lighting schemes which apply the ideas we've been discussing. 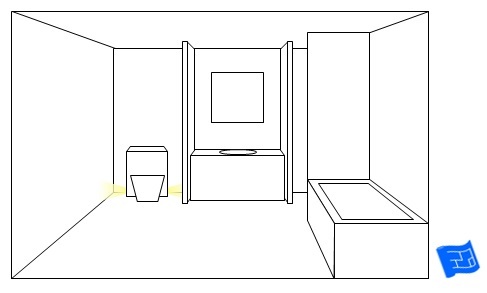 Let's have a think about the activities that go on in a bathroom to help us figure out the lighting requirements. Bathrooms are for washing and grooming so so we need general lighting and good mirror lighting. Many of us look to the bathroom as a place of relaxation for a long hot shower or luxurious soak in the bathtub. This means it's worth including some lighting that will create a relaxing mood. If you make trips to the bathroom during the night then some floor level soft bathroom lighting ideas will prevent you stubbing your toe on the wc. 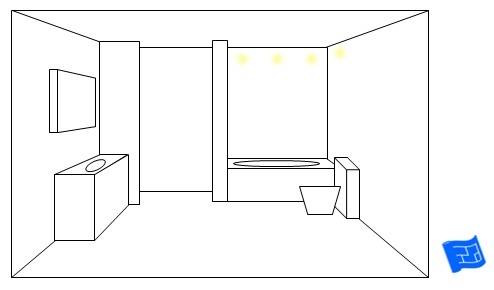 All the usual lighting ideas can be applied to general lighting in a bathroom. 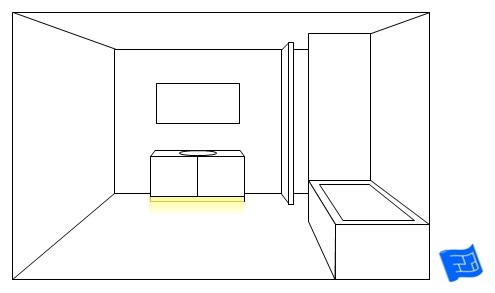 General lighting is usually provided from overhead from a pendant, globe or a few downlights. The beauty of the bathroom is that the fixtures and fittings break up the bathroom into different areas which all have different lighting possibilities. Your mirror lighting could be the difference between you saying 'hey gorgeous' or 'Oh God who's that?' to yourself in the mirror. Get your mirror lighting right and you can achieve a flattering light that will have you heading out with a spring in your step. Of all the bathroom lighting ideas, mirror lighting is perhaps the most important. To achieve good mirror lighting what you need is an overhead source mixed with light from the side. This first picture is the first building block in a good mirror lighting scheme, the light beam needs to have a reasonably wide angle. We'll start with three ways of providing the overhead lighting. First of all, there's the standard overhead bar light. Use a single spotlight from above. Or if you have a wide mirror use two spotlights. The ultimate in mirror lighting is to combine a low voltage overhead light with mains voltage lighting from the side. So let's look at some options for lighting from the side. Light sources placed at the side of the mirror will enhance your skin tone. In the picture below the light source is set behind the mirror. It works well if the mirror is a cupboard and stands out slightly from the wall. This lighting on it's own gives a lovely relaxing glow. For activities such as shaving or applying makeup this mirror lighting set up should be combined with an overhead light. Equally you could go for an all round glow, which again would benefit from an additional overhead light source when more light is required. Another option for lighting the mirror from the sides is with sconces. Below the sconces are very traditional but all styles of sconces to the sides of the mirror will provide the light you need. Another possibility is to mount the sconces on the mirror itself. This can be a good way to go if your mirror is wide. Bar lights either side of the mirror provide light evenly over the height of your mirror. Similar to the principle of providing a glow around the mirror you could take inspiration from dressing rooms and install spotlights around the mirror. On a dimmer switch this arrangement would do nicely for both grooming and for a more relaxed mood. And then there's the pendant trend which is another way of providing lighting from the side of your mirror. Just remember that this solution doesn't mix well with a medicine cabinet. You don't want to be knocking into a lampshade every time you reach for the toothpaste. 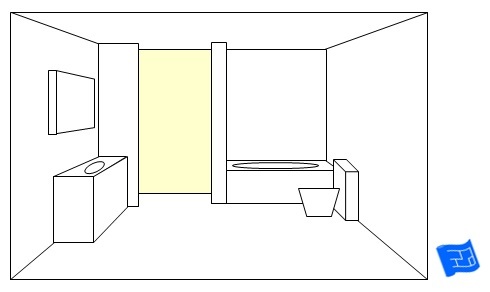 In this picture the wash basin has been enclosed by two walls which provide a bit of separation and privacy from the toilet and shower. And those walls present further lighting opportunities. Here we've got bar lights on the walls to each side rather than on the back wall. 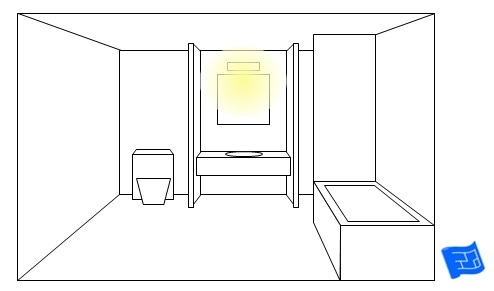 The light should be positioned fairly close to the mirror or the effect will be of a washed out face reflected in a dark mirror. Include a source from overhead (low voltage) and a source from each side (mains). 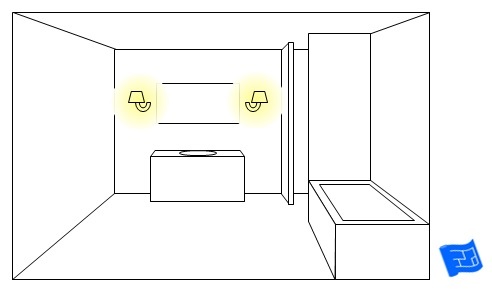 Put the source from above and the source from the side on a separate circuit so that you can switch one of them off to lower the light level and create a more relaxed atmosphere. A dimmer switch can work magic. If you have a bath the chances are that you use it to bathe for relaxation and if there are young children in your household it's a much loved part of the routine. So let's have a look at some of the ways you can light your bath. Think about the lighting in terms of how it makes your bathroom look and how it will enhance your experience of being in the bath. In this first picture there's a ceiling globe installed above the bath. 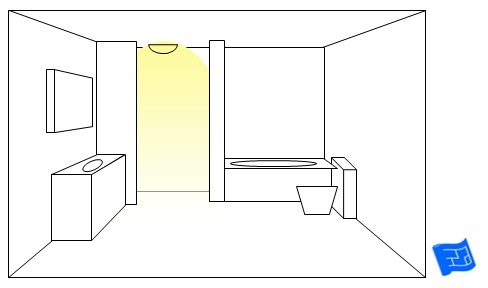 If you go for this option make sure the light isn't too bright or you'll need sunglasses when you're lying in the bath. In the next picture we have two spotlights above the bath and lighting on the lower side of the bath panel. We've already talked about how it's important to avoid glare so the secret to this lighting scheme is to place the spotlights near the back wall and angle the light toward the wall. This will create a wall wash and the the light will diffuse off the wall. The light in the bottom of the panel of the bath is ideal to keep on during the night to provide night time lighting if you need to go to the bathroom during the night. In the set up below the same effect is achieved using strip lights (try a rope light or an LED strip) in the join between the ceiling and the wall and in the bath panel. 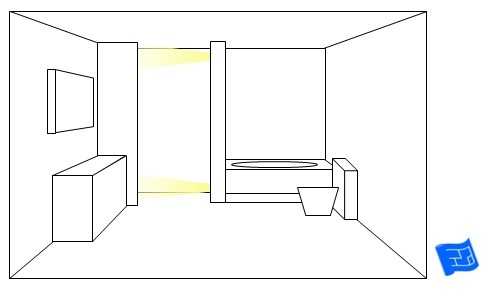 Creating a panel of light behind the bath is another option. Wall mounted lights would create a ceiling wash that will gently reflect down to the bath. 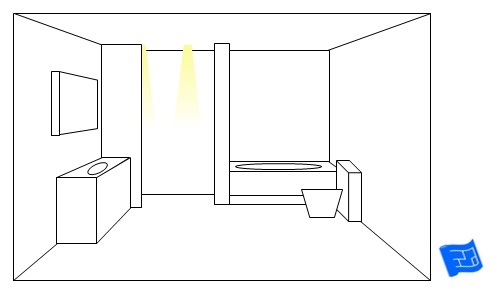 This option adds more to the appearance factor of your bathroom, rather than functional light around the bath. Some lighting at eye level (eye level when you're lying in the bath) creates an intimate focus around the bath. A subtle upwards wall wash is one way of doing this. It imitates the light that candles give. A niche around the bath is a great way to add visual interest and provide intimate bath level lighting. Moving along then, to the shower. These illustrations are of a built-in walk-in shower and the ideas can be adapted for other shower configurations such as a glass shower cubicle. Starting again with the overhead dome light. A bright overhead light provides functional lighting for the shower. The only thing I don't like about having a purely overhead light in the shower is that if I want to shave my legs in the shower my body creates a shadow so it's hard to get good light down onto my legs. 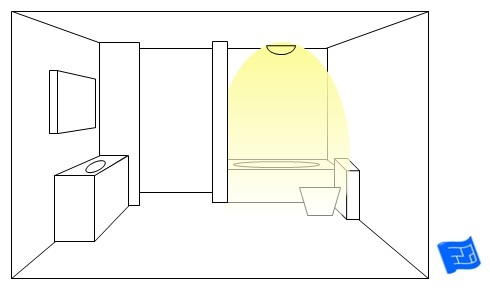 Another option for overhead lighting is one or two downlights depending on the size of your shower. 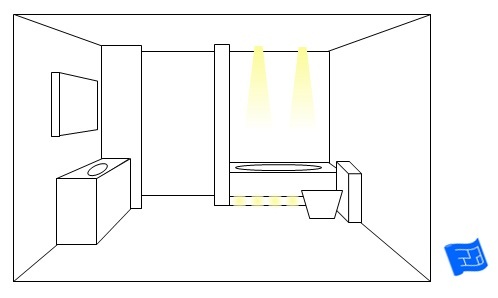 These downlights can be placed along the central line of the shower or (and this is my preference) more towards the back wall and angled towards the wall to create a wall wash which reflects light back into the shower. Strip lights can be used to create a wall and floor wash. Among the bathroom lighting ideas, this one needs to be worked into your plans to provide the slots into which the strip lights will be placed. Wall mounted downlights, either one or two depending on the size of your shower can be a good solution, particularly if your bathroom has high ceilings. High and low mounted spotlights create a dramatic shower lighting scheme. There would be two further lights placed on the left wall of the shower in this picture. I guess you could put in a mid level one in as well. The lower level light would provide ideal light for shaving those legs! Sticking with the same theme of sideways lighting, another options is to use smaller LEDs and put in a row of lights. This is one of my favorite bathroom lighting ideas, where the whole of the shower wall is lit up. This sheds an even glow throughout the shower space. Put this lighting panel on a dimmer switch and you have a bit of bathroom lighting magic. If you're luck enough to have a niche in your shower why not include a small downlight? You'll be surprised how many different bathroom lighting ideas there are for your washbasin. If you have a sink built in to a vanity you could think of setting a lighting strip just under the vanity surface for a gentle glow. You could go for a light strip or maybe a row of LEDs in the vanity toe kick. A surface mounted sink presents the opportunity to install a few small uplights in the surface of the vanity to light up the washbasin. 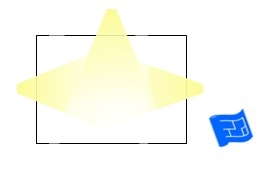 This square shape seems to call for backlighting. Here's a different design of vanity which floats above the floor so lighting it from underneath seems like the natural thing to do. Here's an under-glow courtesy of a light strip. Or you could light both above and below the vanity from the side. 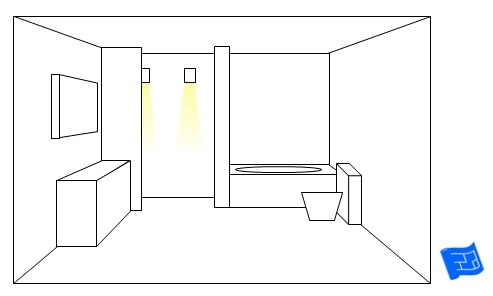 A niche above the wash basin creates a lighting feature. Many of the mirror lighting ideas above also contribute to your lighting around the washbasin area. We'll finish with the throne of the bathroom, the toilet, the water closet, the lavatory and various other perhaps more unsavory terms. So, what is required of toilet lighting ideas? I'm the only female in my household, so I like the men in my life to be able to see what they're aiming for, and certain members of the household like to read on the throne. You could go with a basic ceiling mounted globe. A niche behind the toilet is a great place to keep spare loo rolls. You don't want anything too distracting though - eyes down boys! How about a niche behind the toilet? If you have a fancy built in cistern this lends itself to a wall glow. Floor level lighting near the toilet can come in handy at night time. A low level glow from the wall behind the toilet is an option. It would be great on a dimmer switch as low level lighting at night time. 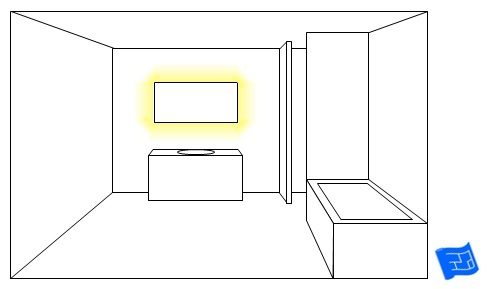 Or bring the idea of cove lighting to the wall and create a glow around the back wall. 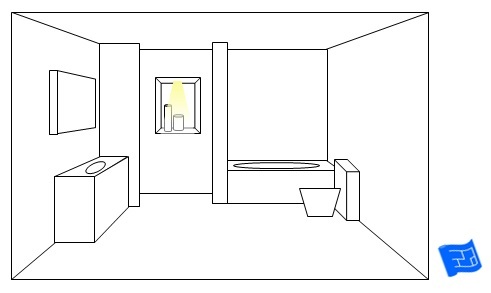 Phew - now that you've seen the simplified pictures of bathroom lighting ideas you can take a look at how some of these applied. This is the part where we take a look at some real life bathroom lighting ideas. It gives us the chance to see some of the ideas on this page put into practice.